CAMARILLO, Calif., Sept. 20, 2018 – Semtech Corporation (Nasdaq: SMTC), a leading supplier of high performance analog and mixed-signal semiconductors and advanced algorithms, will exhibit at the 44th European Conference on Optical Communication Exhibition in Rome from Sept. 23-27, 2018. 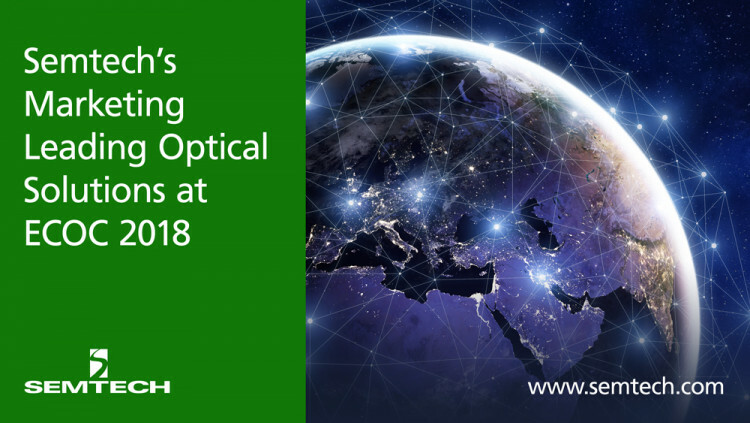 Semtech will highlight its diverse portfolio of networking solutions for a variety of high-speed optical communication applications in booth 424 and demonstrations are available by appointment. At ECOC 2018, Semtech will highlight multiple products including the ClearEdge® CDR Platform for low-cost 25G SFP28 SR Modules and Active Optical Cables. Additionally, featured devices include cutting edge laser drivers, limiting amplifiers, ROSAs, signal conditioners, transceivers, and transimpedance amplifiers (TIAs). Semtech is a market leader in high speed optical transceiver ICs and offers optical networking solutions that support multiple next-generation PAM4 and NRZ connectivity standards including Ethernet, PON, Optical Transport Network (OTN), Fibre Channel, and InfiniBand®. Request a meeting by contacting meetings@semtech.com. Visit www.semtech.com/optical and download the solutions guide for more information regarding Semtech’s optical products. Find Semtech on Twitter, LinkedIn, YouTube, and Facebook. Semtech, the Semtech logo and ClearEdge are registered trademarks or service marks of Semtech Corporation.